A popular topic request among many of you was women artists. We have a lovely column in Victoria magazine called Artist-in-Residence. It highlights women who have used their talents to create beautiful things and share them with others! Today I am sharing an excerpt from Victoria by Cynthia Reeser Constantino about fashionista and design maven Carolyne Roehm. I hope you are as inspired by her beautiful creations as I am! In a pursuit that has become a form of meditation, she looks to Merian for inspiration. “Despite her scientific intentions, Maria was a great visual fantasist,” Carolyne writes in At Home in the Garden, “and her pictures inspired me to put together elements from my garden in ways that are less literal and more playful and narrative-rich.” Look for Carolyne’s paintings, now available on note cards (see below), at carolyneroehm.com. I think expressing ourselves through what we love is well worth prioritizing. For me, it is often sewing. How do you express yourself through hobbies or art of any kind? 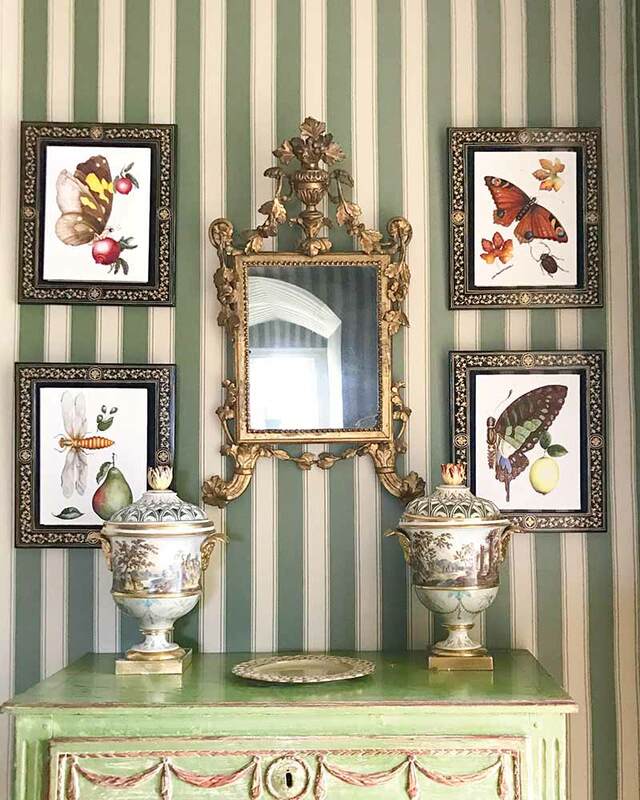 Carolyne Roehm is truly a magnificent talent in all aspects of art and design Love Carolyne’s artwork and now off to the site! 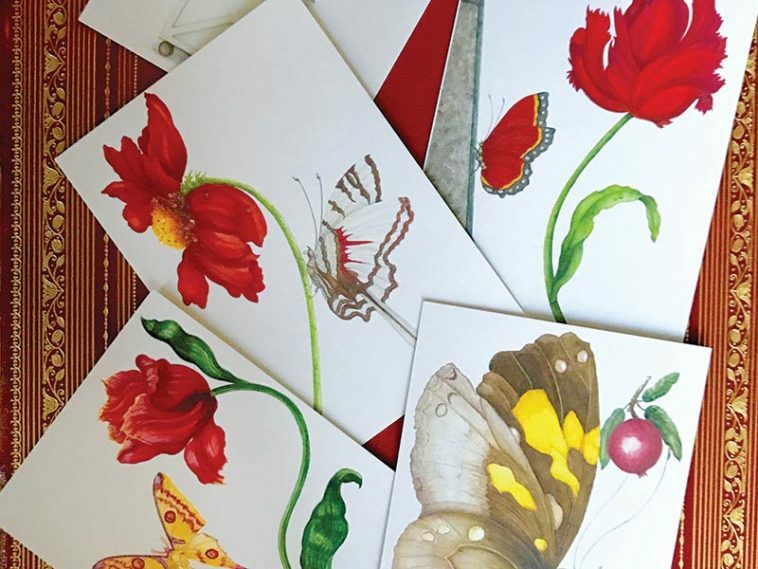 Over my 70+ years, I’ve expressed art in several different ways: decorating cakes to match party invitations; sewing pillows, curtains, table linens; gardening with flowers; and now my passion is watercolor – something I’ve never been able to squeeze in until now. 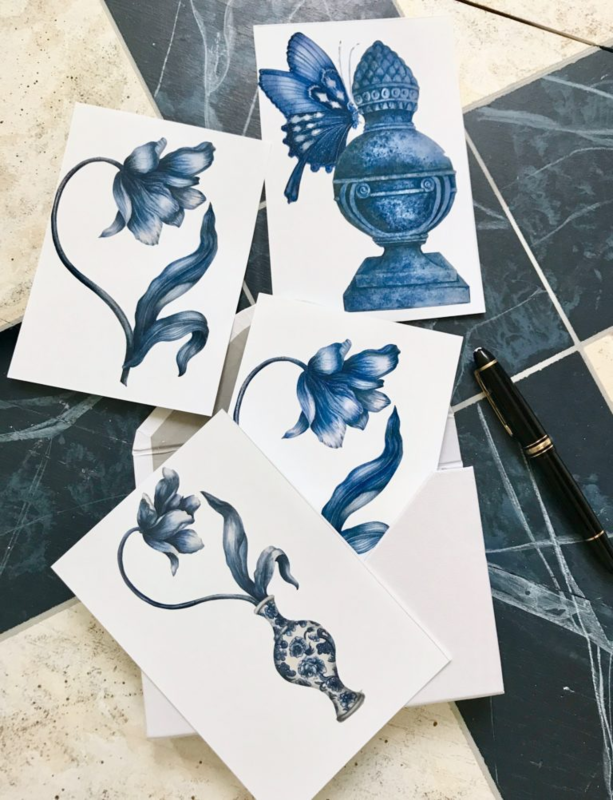 I particularly enjoy painting cards that evoke a smile for family and friends. I take a weekly class and in addition paint at least a little while after work everyday. My life is so much richer with art!!! I love to bake cup cakes for special occasions and decorate the house for themed occasions such as March Madness right now!!. I also make up melodies on the piano and play them for my husband. I was truly inspired by these beautiful creations. I used to decorate for weddings, and even did some decorating for friends who had bought new homes. I never made any money from these things, as I wanted to do favors for friends whom I loved. I actually taught piano lessons for over 50 years, and enjoyed every minute of it. I still hear from friends across the US who are still playing the piano for their families, churches, etc. Since I am 82 years old now, and my eye sight is not good, I can no longer do many of these activities. But I can still play the piano, and enjoy it almost every day. I don’t have to have my eye sight to do that. And I can hear my Bible readings on CD or DVD. What a great day in which we live! I adore Carolyn Roehm’s Charleston home as well. She has totally embraced the Southern esthetic in decorating. I’d love to see it featured in Southern Lady. I love to do needlepoint and take delight in following how others are getting inspired to take up this lovely art form/creative skill. Finding the time to do all the projects I’ve accumulated (and continue to buy!!) is the problem. I find I divide my “free” time between reading and doing needlepoint-both of which I really enjoy! My self-expression comes mostly through cooking. I love to make nourishing and comforting foods like mushroom barley soup and entree salads, especially for others to enjoy. Trying new fruits and vegetables is an adventure for me. I do want to try my hand at other artistic pursuits such as watercolors or nature sketching. I just recently bought a beginners watercolor guidebook and the tools I will need and am eager to try capturing a nearby garden as best I can. Thats wonderful Martha. I love to paint and I too need to make time!!! Thank you for sharing your memories with us.